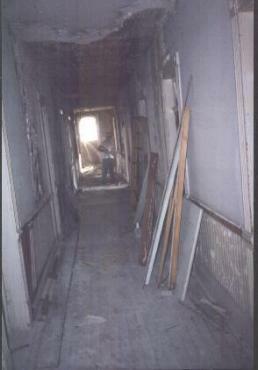 Looking down the hallway of the second floor, you can see Dustin beginning his first cut at the plaster walls. By the time Dustin, Josh, and Joe were finished, you could see sunlight along the whole 120 feet of the floor. Lath, Lath, and More Lath! One of the side effects of pulling down lath and plaster walls is that you tend to accumulate lots of sticks of lath. These are better known as "Pomeroy Tomato Stakes." Thanks to the willing and friendly help of Grant Richardson (to be seen in further pictures) we hauled away thousands of sticks of this wonderful, 100-year-old wood. Bruce Adams -- general foreman, supervisor, and creative genius of the Restoration Project is busily taking apart a 45-year-old shower stall. Nothing like removing a 2'x2' piece of 4" thick concrete to lighten the load! If you Build it . . . . Yes, it took a while, but the historic Hotel Revere now has power inside the building! 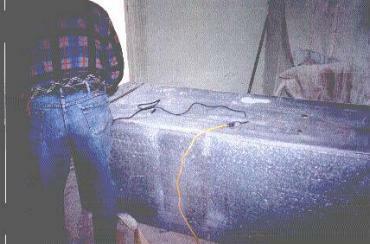 Here Lonny Flynn of Flynn's Electric in Pomeroy is mounting our electric meter box. And, believe it or not -- once the meter box went up, before long, we had a whole crowd of Pacific Power people to hook us up. This windy shot shows Beverly as she carefully peels off over a hundred years and multiple layers of paint to get down to the original color scheme of the Hotel Revere. It looks like we'll have a "butter yellow" front with burgundy doors, and dark blue accents. Here is a wonderful shot of the Men's Room on the main floor of the Historic Hotel Revere. This room is in the portion of the building finished in 1887. And, yes, that is a fax machine in there . . . John has taken over the john for his own private office. No snickers from the peanut gallery please!